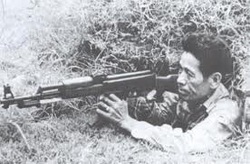 Also in the running for the most popular gun during the war of Vietnam was the CAR 15 also known as the Colt Commando. The Car is a shortened version of the M16 with a telescoping stock. It has an 11.5 inch barrel in comparison to the M16 with a 20 inch barrel. The CAR 15 name was an attempt to re-associate the AR 15 name with ColtThe Car but because AR standed for ArmaLite Rifle. ArmaLite was, and still is, the main company for supplying guns to the US and the rest of the world, But because it was a different company they had to change it to Car 15. They later made starting using the name Colt Commander because it Colt later bought out the name. The Colt Commando was most commonly used by the special operations units that hardly saw the front line during the Vietnam war. The main weapon that the Vietnamese used during the war was the AK 47. The Ak 47 was first developed just after the end of World War 2 by the Soviet Union in 1949. The AK was one of the first weapons categoriesed as an Asault rifle and is still used today by the American army in the Afghanistan and Iraqie wars. Design work for the AK 47 started at the end of World War 2 in 1945 After the war in 1946, the AK 47 was presented for official military trials. In 1947 the fixed-stock version was introduced into active service with selected units of the Soviet Army. In 1949, the AK 47 was officially accepted by the Soviet Armed Forces and used by the majority of the member states of the Warsaw Pact. Throughout the war, the Viet Cong were very creative in creating death traps for the jungle wandering Americans. They ranged from spikes under leaves, to pressure release grenades, they could cause pain or completely obliterate, usually they are deadly.The most prominent trap of the VC was the punji pit, a pit with spikes at the bottom covered by leaves. An american soldier would stumble into the trap, and to make it more brutal, the Vietnamese would cover the spikes with their own excrement. This would poison the wounds of the American soldiers. Another common trap was the pressure triggered rope trap. There were many different variations of this trap but they were all built the same, a soldier would trip the hidden rope, and: set off a grenade, shoot an arrow, or even send a log slamming into soldiers. These traps made it much harder for Americans to manoueveure the treacherous jungles of Vietnam. Nalpalm was a key explosive in the war. Because of the North Vietnamese's gurilla tactics, the americans used napalm to literally burn down the forest, this would expose the Vietnamese from any hiding spots. The only problem was napalm back then was very inaccurate and would often reach civilians. Many innocent civilans were killed by inaccurate shots with the napalm strike. 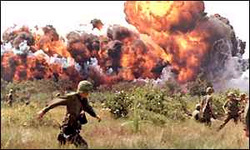 The napalm strikes that they used in the Vietnamwar were a composition of naphthenic and palmitic acid wich caused a giant flammable explosion when hitting the ground. Some equipment that the typical American soldier would carry were smoke grenades, knives, and frag grenades. Of course there were different variations of each of these, for the smoke grenades there were five different kinds, white smoke, red smoke, violet smoke, green smoke, and yellow smoke. There were also different variations of knives that each soldier would carry with them at one time. Such variations include your simple pocket knife to the big and powerful machetes. Finally, there were also different variations of the frag grenade such as the typical pineapple frag to the smaller, lighter, M67 and M61 grenades. There were no major differences in the models other then the size and the weights.